Hooked On The American Dream: Vanity Fair-Mod Character Study As Classic Film; Antonioni's "Blow Up"
Vanity Fair-Mod Character Study As Classic Film; Antonioni's "Blow Up"
Forty-five years ago, English model Jill Kennington agreed to appear in an art-house film—one that would memorably capture the energy of London’s 1960s fashion and art scenes. Michelangelo Antonioni’s 1966 classic, Blow-Up—his first English-language film—was a sensation, and earned the Italian modernist Oscar nominations for directing and writing. Today, Kennington discusses her participation in Blow-Up and the real-world London atmosphere it depicted with Philippe Garner, international head of 20th-century decorative art and design at Christie’s. 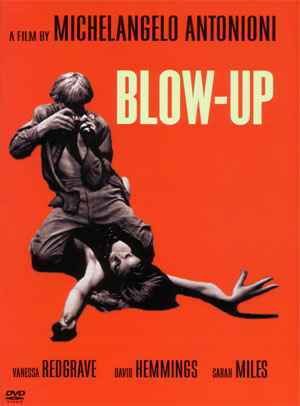 With David Alan Mellor, Garner has co-written a book that analyzes and contextualizes the film: Antonioni’s Blow-Up. (Steidl). Philippe Garner: Jill, your role in Michelangelo Antonioni’s Blow-Up created an indelible image that has become emblematic of the London scene in the 60s. How did it happen that you got cast for the film? Jill Kennington: I remember excited whispers going round London: “Antonioni is going to make a movie here!” He was very well known to me for his beautiful and often strange films, so I was intrigued, but it took a while to understand that he was interested in the London 60s scene—in particular the world of fashion photographers and models. I then often saw him sort of skulking around, not wanting to be noticed, alone, just taking it all in, both in the trendy discotheques, watching, and in my favorite Italian restaurant, San Lorenzo. One day he turned up on a shoot I was doing for Queen magazine at David Montgomery’s studio. I remember there were two other girls; we were introduced, told he was just going to watch and to ignore him. This was very easy, as he just faded away to a gray figure alone at the back. I was a bit disappointed that the shoot was quite abstract and graphic, not typically my type of work. Of course, only when the filming started, with five girls, could I see how that shoot had given him ideas and inspiration.